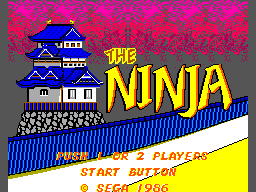 "Throughout your journey to the Ohkami Castle, you'll battle evil ninja warriors. Once there, you must destroy their leader, Gyokuro. Only then will you be able to save the princess from her prison inside the castle." Level 1: You get one after killing a rock ninja, easy to find because you have to kill the ninja. 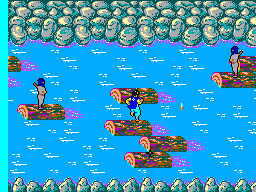 Level 4:After you kill the first kunoichi (girl that jumps from behind the wall), you'll come to two dog statues. Shoot the one on the left five times. Level 6: In the first island part of the level, move in front of the tree in the top corner and it will appear. 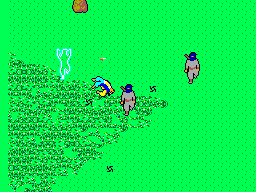 Level 8: Just before you fight Gyokuro, you'll see a small grass area on the right. Go to the top left of this screen and stand near the tree, it will appear. Level 9: This is the final scroll. This one will only appear if you've collected the others, it will be at the top of the wall you climb. Kill the two ninjas on the right and the other two if you need to and grab it. On the Game Over screen, don't press anything. The game will return to the Sega Mark III logo; during the logo, press U]x5, Downx3 (if playing as Player 1) or Upx3, Downx5 (if playing as Player 2). When you start the game you will continue from the stage you died on.